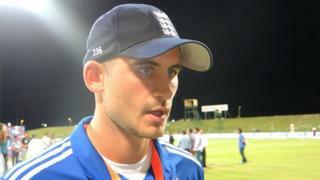 Alex Hales describes striking his maiden ODI century as "an amazing feeling" after leading England to a 95-run win over Pakistan in the second ODI to level the series at 1-1. England's total of 283-5 was built on Hales' 109 off 117 balls, supported by Jason Roy (54) and Joe Root (63) and a strong bowling finish raised Pakistan's hopes but they collapsed to 50-5 with the bat. Chris Woakes took 4-33 and David Willey 3-25 as the hosts were dismissed for 188 in 45.5 overs.